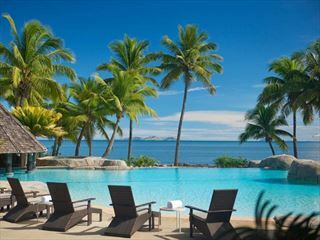 Fiji is well known for its small, remote islands shrouded in lush, tropical forest and lined with white sand beaches – but what about the culture? 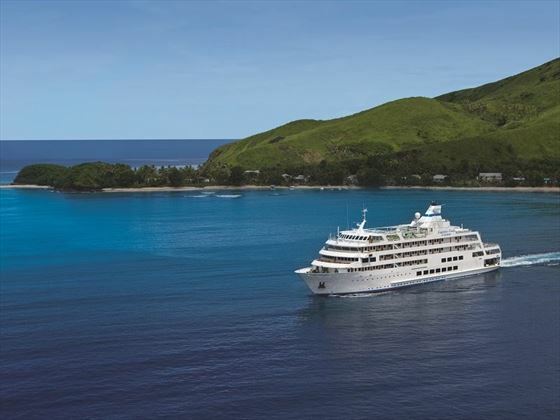 This fantastic seven-night cruise delves into Fiji’s four distinctly different cultures - the Ellice Islanders (Polynesian), Banabas (Micronesian), Indian and Fijian (Melanesian)– to give you an unforgettable insight into the destination’s rich heritage. Starting with Tivua, you’ll cruise to the Kioa Islands first to see the traditional lifestyle of the Ellice Island people, before venturing to Ravi Island to see the Banabas Islanders. A village sevusevu ceremony, meke and lovo feast on Druadrua Island immerses you in the Fijian culture, whilst a Bollywood inspired evening in the town of Labasa will introduce you to the Indian heritage. In between discovering these vibrant cultures, you’ll have ample opportunity to snorkel or dive crystal-clear reefs, enjoy glass bottom boat tours, and dine of delicious food. 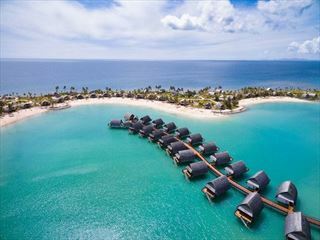 Today you will be board the ship at Denaru and be welcomed on board the Captain Cook Cruises ship with a complimentary fruit punch, before sailing to Captain Cook Cruises’ own exclusive island known as Tivua, here you can indulge in a twilight swim or snorkel and simply relax on the sandy beach. 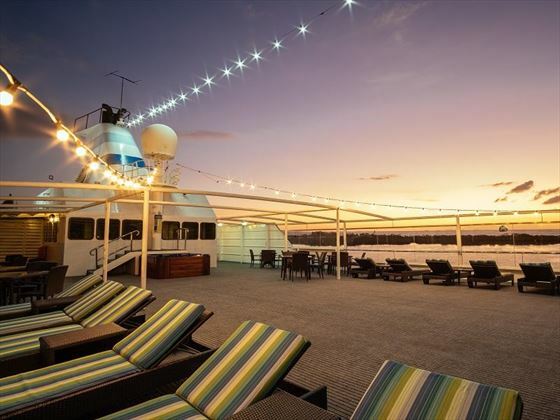 As the evening draws in, you’ll pop back on board for a special Welcome Dinner and crew entertainment. Populated by the South Sea Islanders, the beautiful Kioa Islands are freehold islands that were granted full citizenship by Fiji in 2005. Settled by the people of Tuvalua Island (Ellice Island) after they were displaced by rising sea levels, this is your chance to meet these fascinating people and delve into their traditional ways. You’ll have the pleasure of seeing a vibrant cultural presentation, before having the rest of the day free to snorkel and dive in the crystal-clear reefs and coral gardens. Home to the Banabas people from Ocean Island in the Pacific, the volcanic Rabi Island is shrouded in thick forest and lined with golden sands. 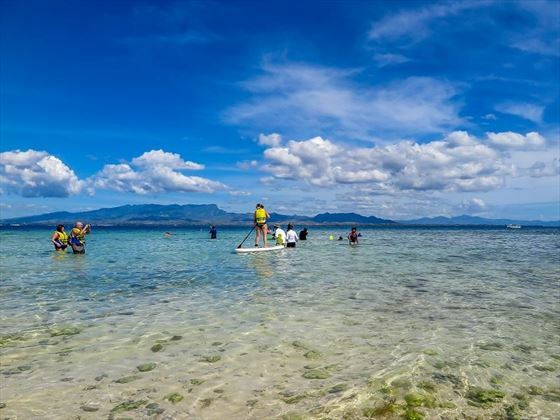 Today you’ll meet the local and be introduced to the different culture and lifestyles of the Ellice and Banabas Islanders, before enjoying a few beach activities and snorkelling in the pristine Albert Cove. 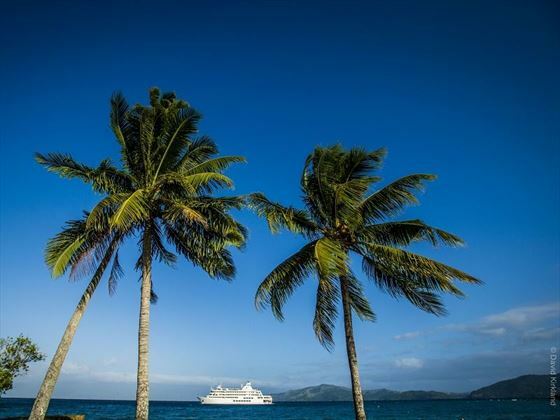 Today you will sail across the north-eastern tip of Vanua Levu to arrive at the picturesque Druadrua Island and visit the local school. 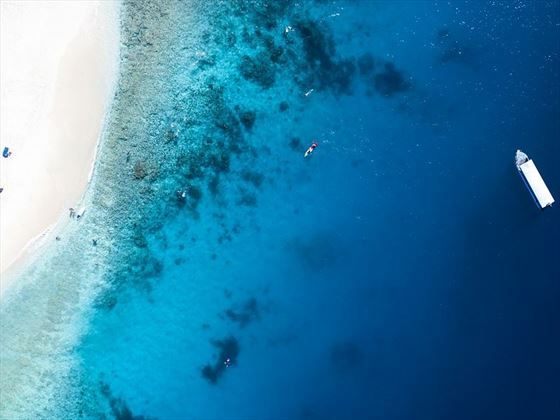 In the afternoon, you’ll have the amazing opportunity to snorkel and dive in the world’s third longest barrier reef, The Great Sea Reef, which is home to an abundance of impressive marine life, or you could hop on a glass bottom boat trip. In the evening, you’ll head back to Kia island for a vibrant, traditional Fijian evening with a village sevusevu ceremony, meke and lovo feast. Your journey will bring you to Vanua Levu’s largest agricultural town, Labasa, nestled on a delta formed by three rivers – the Wailevu, the Labasa and the Qawa. As sugar cane is the main industry here, you’ll travel by local bus past the sugar cane mill, before visiting the Hindi Snake temple for an extra dose of culture. The afternoon will be spent working your way through the lively and bustling markets full of spices, poultry, fish, goat and local produce. Afterwards, you’ll retreat back to the local hotel and enjoy a cup of tea as you’re entertained by a Bollywood style dance troop. Lazing on the beach, beachcombing, swimming and exploring the unspoilt beauty of Galoa and Nanuku Islands and their azure reefs is on the cards today. The day is free for you to do as much or as little as you like – whether that be enjoying a glass bottom boat tour, or simply sipping a refreshing cocktail by the pool. You’ll also have the opportunity to experience a local church service and be taken aback by the delightful sounds of the Fijian choir. 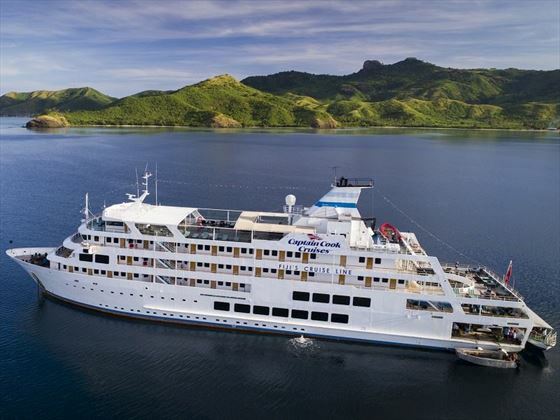 On your last full day, you will sail across the Bligh Water (a body of water named after Captain Bligh of Mutiny) to arrive at the final destination: Nananu-i-ra, a stunning island off the north coast of Viti Levu. Here you’ll have an afternoon to swim, snorkel or relax on the beach, or even enjoy a hike to the lookout for wonderful views of the Bligh Water. 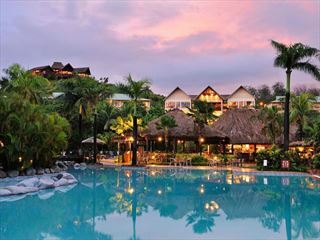 In the evening, you’ll don a sulu (sarong) and join in with the Pacific Island Night Finale celebrations. 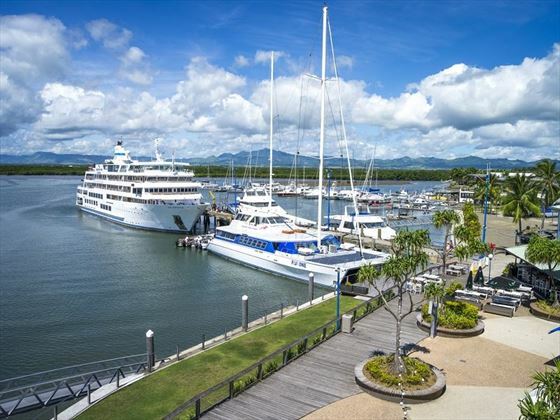 This morning you will tuck into breakfast before returning to Port Denarau Marina where your cruise will end. 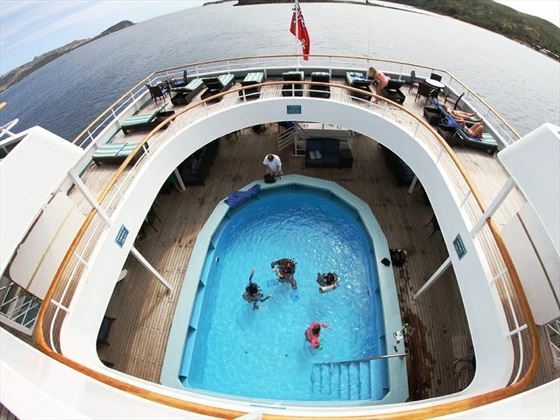 Porthole Cabins – Located on D deck, with porthole windows and a door opening out onto the inside passageway. These can come with twin, double, or bunk beds. 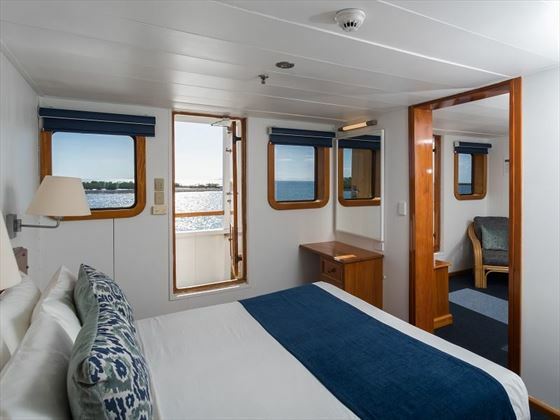 C & B Ocean Staterooms – Nestled on the upper and main decks, these double or twin staterooms have a door leading out onto the outside walkway, plus small picture windows. 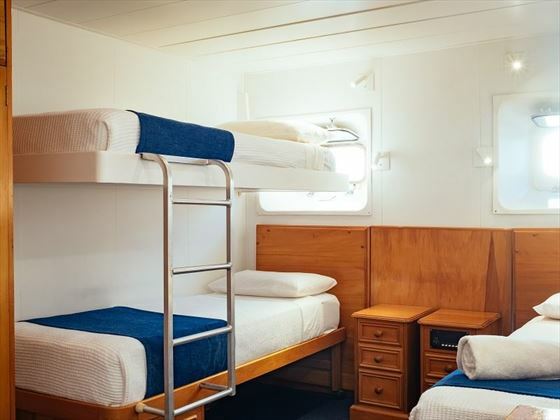 Connecting Family Staterooms – There are six staterooms that can be connected by an adjoining door, ideal for families. 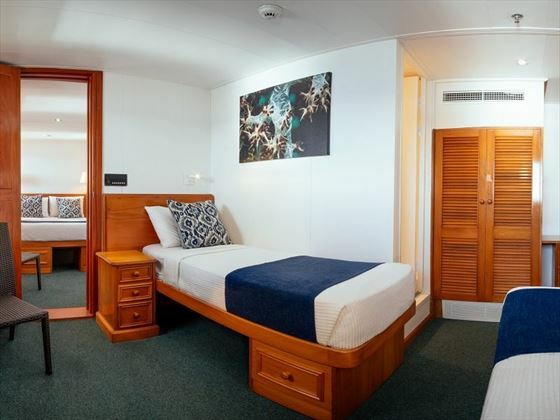 The Staterooms are located on the upper and main decks and open out onto the outside deck. Tabua Suites – Featuring a bedroom, a separate lounge with a chair, desk, TV and DVD player, plus a fridge, tea and coffee making facilities and a second bathroom. Located on the upper deck. 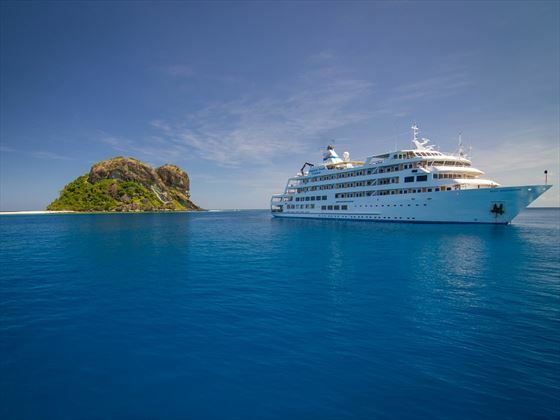 A brilliant 14 night tour and cruise starting in Sonaisali Island and ending in the Malolo Lailai islet, taking you to incredible unspoilt islands and charming villages, as well as including exciting excursions, such as a jet boat safari.